cite as: University of Hawaii at Manoa, School of Ocean and Earth Science and Technology (SOEST): Archive of SOEST geosample data and information. NOAA National Centers for Environmental Information. doi:10.7289/V50P0X05 [date of access]. Open an ArcGIS interactive map interface with the SOEST sample layer active, to search and download data from the IMLGS database and access related links. Text interface to search and download data for SOEST samples from the IMLGS database and access related links. How to cite this data set (doi:10.7289/V50P0X05), all access options, and complete documentation. Documentation about SOEST, see Marine Geology research theme for more information. Data Update Frequency Irregular - SOEST has recently begun to contribute data to the NCEI archive and to the IMLGS as they are able to inventory and digitize information about their dredge collection. SOEST core data in the IMLGS were contributed prior to, and have not been updated since approximately 1990. SOEST has an extensive dredge and core collection, primarily from the Pacific Ocean. Dr. Fritz Theyer, former Curator for the Hawaii Institute of Geophysics, participated in the design of the original IMLGS. Purpose The purpose of adding information about the SOEST geological samples collection to the IMLGS is to promote new research on existing samples. The SOEST core and dredge repositories have received support from the U.S. National Science Foundation in the past. 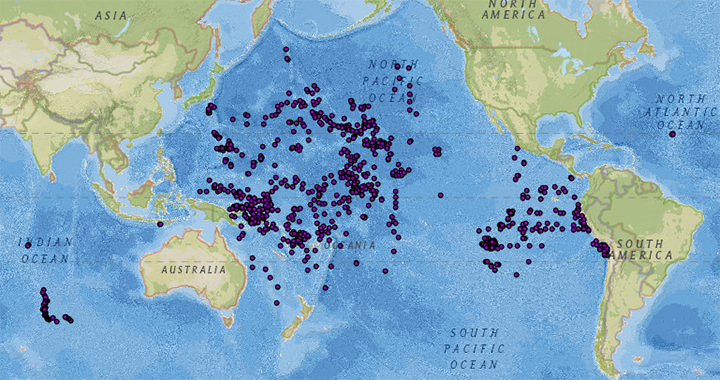 Other Constraints cite as: University of Hawaii at Manoa, School of Ocean and Earth Science and Technology (SOEST): Archive of SOEST geosample data and information. NOAA National Centers for Environmental Information. doi:10.7289/V50P0X05 [date of access]. Description of Source: The SOEST source database is not available online. SOEST is in the process of cataloging their dredge collection, and has additional information in local spreadsheets.